Is your website not getting enough leads? Have you been trying to grow your business online but reached a stumbling block with your website enquiries? Are you not getting enough traffic? Are people getting lost in your website? Do you struggle to convey exactly why you’re great at what you do? The reason why your website is not selling enough might be down to one of the above – but more often it’s a combination of different factors. If we understand correctly, you probably can’t decide which areas of your website need immediate attention. How do you choose where to invest money? Do you need to get some SEO work done? Do you need to create more blog posts or add more pages? Should you get in touch with business influencers? Does your website structure need changing? Do you need to update website images or change the colour of your buttons? Deciding on which area to focus on can be daunting and confusing. You are paralysed and keep hold of your cash – only depending on footfall, existing customers and referrals. Your business is not growing. Your competitors are getting the clients that should be yours. Your customers are not getting all the benefits you can give them. We speak to you to find out what you want to achieve for your business. We listen to you tell us about your clients, business model and the products and services you provide. This helps us build a picture of where you are now and where you want to be. We analyse all the data available to us to find out more about your business and potential opportunities. This includes your Google Analytics data (if you have it), SEO, paid search and social media research and competitor research. Give us a week to review and combine all data. We combine all data and use our knowledge and experience to suggest a digital marketing strategy to grow the number of leads you get online. We benchmark estimated results, so you can make an informed decision on whether to take it forward or not. We have another call or meeting with you to present our results. With your strategy developed you can feel confident about making the right marketing investments. Your report will list the options you can take to generate more leads online. Each one will have a breakdown of what is involved, including effort and timescales. Most importantly, we will show you what opportunities you have and what results you can expect. We will include a proposal of what implementing these solutions will cost with us. We have options for acting as a consultancy or a full-service digital marketing agency – depending on your requirements. We are a team of freelancers and don’t have the usual agency overheads. Our packages start with just £500 so they are affordable for small and medium size businesses. Your strategy report will list actionable activities your business can do to start getting more leads. Because we identify and prioritise each activity, you will know specifically what to focus your efforts on and where to invest your money. – Other rushed tactics misleadingly promising short term gains. – Over 10 years of digital marketing experience. To make the report relevant to you we’ll also give you an idea of how much implementation will cost, what returns to expect and within what time frame. Once we receive your booking, we’ll be in touch within one business day to confirm the call/meeting details. Meetings are available in the Greater Manchester area only. If you’re outside of that area, we’ll have a call. 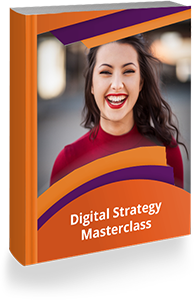 Learn how to develop your digital strategy and start generating more leads online.